Because it’s Oral Cancer Awareness month, last week, we told you the basics that you need to know about the disease. This time, we’re going to talk about the importance of early detection and how you can take your oral hygiene routine to the next level by performing regular self-examinations. Oral and oropharyngeal cancer kill one person every hour of every day of the year. The statistics are terrible because these cancers are often discovered late in their development. Early detection is key to beating cancer. When cancer is identified and treated early, a patient’s survival rate is higher. When mouth cancer is diagnosed at an early stage, the chances of surviving it are nine out of ten. This is why you need to be more aware about what’s going on in your mouth. Pay attention to any changes. And if you notice anything unusual, tell your dentist or doctor immediately. The best way to detect oral cancer in its early stages is by regular examinations by your dentist. But in between visits, you must also take it upon yourself to be aware of your mouth’s health. Look in the mirror. Check for symmetry. Both sides of your face and neck should appear the same. Check the skin on your face and neck for any changes in color, lumps, sores or moles that have changed in color. Use your fingertips to feel the sides of your neck gently. Note if there are lumps, bumps or sore spots. Place your fingers over your Adam’s apple and swallow. It should move up and down and not side to side. If you notice any hoarseness that doesn’t go away in two weeks, report it to your dentist or doctor. Remove dentures or any dental appliance from your mouth. Check the inside of your mouth. Use a flashlight if you must. Check the roof of your mouth. Use your index finger (make sure it’s clean) to feel for changes. Notice any lumps or a difference in color? 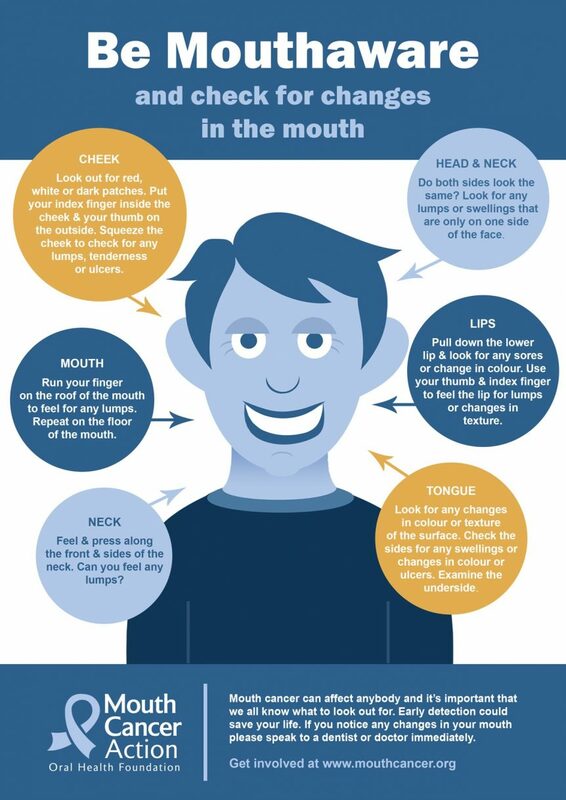 Use your index finger to check the roof of your mouth. Are there changes in color or shape? Is there swelling? Inspect your tongue. Examine its sides. Feel it with your fingers. Look at your gums. Run your index finger over them. Are there any lumps or bumps? Is there any tenderness? Notice any changes? Pull up your upper lip and pull down your lower lip. Check these areas too. Gently squeeze your lips and your cheeks with your index finger and thumb. Feel for lumps, bumps or tenderness. If there is pain, loss of feeling or bleeding, report this to your dentist. If you notice anything unusual, see your dentist. Do this monthly. And spread the word to your loved ones too. You might just save a life.